Hey, here is our Flashlight coming two year old stallion prospect. He is very mild mannered. This is after about 6 rides only two outside. I trotted him up to the house and TTB took his picture for fun. Katrina knows a lady that helped the vet at Valentine during breeding season. I haven't heard many people complain about Flashlight. This guy we are going to try on the track and see if he has enough speed to scatter his own turds. Nice looking horse, and that is a distinguishingly pretty brand on his hip. He should be all that you desire him to be and more. Woaaaaaaaaah!! Is he handsome!!! So tell us again how he is bred. brutal.) I'm just too soft. Seen too many things I guess. You don't see many truly BLACK horses much any more. Striking! thank you Soapweed. There is a reason we like to sell weanlings, when I get to riding the young ones like this I have a real tough time selling them. FH we grew up riding horses that have been on the track. I can't say many were any worse for the wear. He is a CS Flashlight and is mother goes back to Special effort, so he has a little running blood in him. We hope he does well but time will tell. Effort was AQHA's only Triple Crown Winner. His speed index was 104. I think he's the sire of Bully Bullion, who makes some real nice using horses. Good look with your black stallion. He sure is a good-looking rascal!! Keep us in the loop with him, would you please? He's pretty exciting! I sure like him! How's his little sister? Can Bricelyn still crawl all over her? Course you might have sold her. His little sister is already turning grey. She might be better than he is. Bricelyn needs to do some work with her, I am sure she will be climbing on her very soon. We just weaned her and two others that we will keep until yearlings. One more flashlight and a full brother to this years state 4-h barrel racing champion horse in the senior division (he got cut right before the sale and we had to pull him out). That horse is only six and Jill Moody tried to buy or lease the horse. It should be fun to watch the next four years because Pipers owner is just a Freshman. Sorry you had to swim and walk today Nicky. I love this video.... Can this horse fly or what??? Well if he can run as good as he looks.............he is a winner. Thanks for the picture and your info in the message. 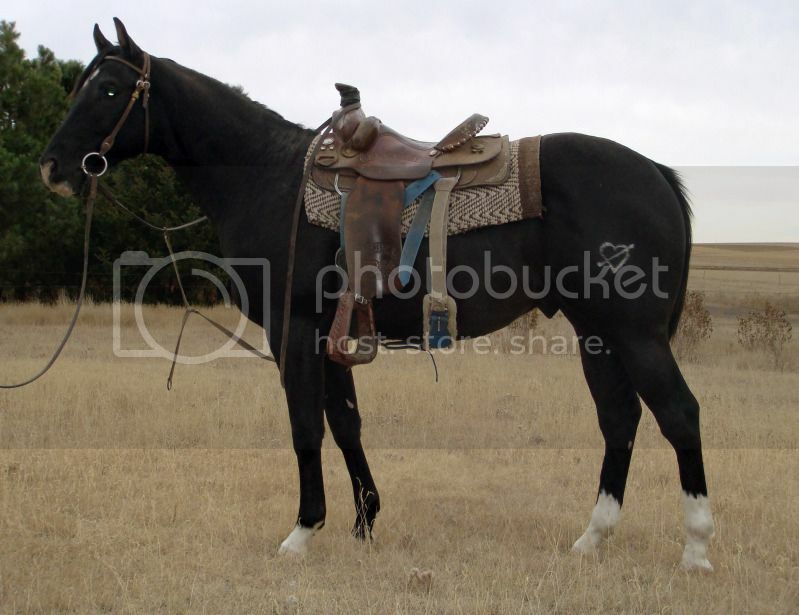 I should probably get in touch with Fulton's and decide if we are going to breed this mare of ours.